From when I first found out I was pregnant, I knew I wanted to take my baby outdoors. Then she came along and I realised that I didn't quite know how to do that. Sunblock isn't suitable before three months (six, if it's not specific baby sunblock); I felt it was my duty to keep her completely dry at all times; I was never sure that I had enough nappies and milk with me to safely leave our living room. And besides all that... what do you actually do with a baby outdoors? It's not like they can plant seeds or climb up trees yet. And then I realised that it's all about the sensory experiences. It's very much about taking them out of the pram/buggy/carrier and letting them interact with the world for themselves. Babies can be really intrigued by the scent of flowers; slightly older babies will also love the bright colours. Do be careful, though, as some flowers (such as foxgloves) can be poisonous; edible (although not necessarily tasty) flowers include nasturtiums, marigolds and lavender. That tiny bit safer than flowers because they're definitely edible! 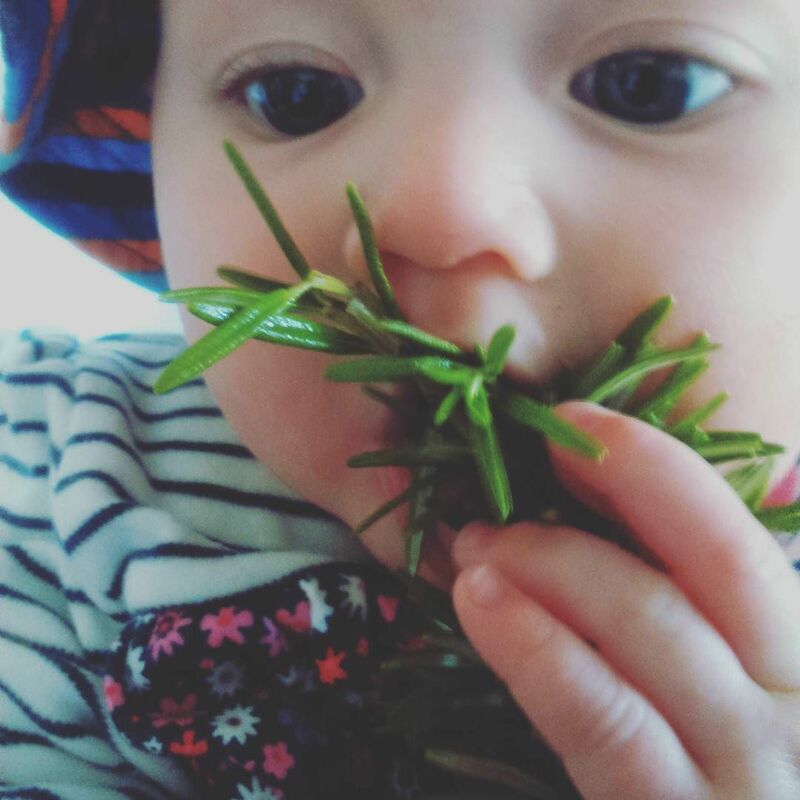 MM was particularly taken with rosemary but there are all sorts of herbs you could plant in your own garden; if you don't have a garden, see if you can find some wild garlic locally - it's flowering right about now and is most pungent after a rain shower. On warm days, take their socks off for a little while and let them grab at the grass with their fingers and their toes. Encourage them to touch new textures. Let them crawl on grass, grab fistfuls of fallen leaves and shove their hands in the dirt. Obviously, you'll want to keep an eye on them to make sure they're not doing anything hazardous, but take a deep breath and let your kid get grubby (puddlesuits are a great investment). They might not be jumping about in wellies yet but, if your child enjoys splashing their hands in the bath, they will most likely also enjoy splashing them in puddles (the end of a wet slide is still a favourite with MM). Let them feel the breeze on their face and listen to the birdsong and watch dandelion seeds blow past. The tiniest things are new to them. Give them time to absorb it. If you want to create more tiny, new things hang wind chimes or blow bubbles (blow bubbles at every opportunity - I've yet to meet a baby who doesn't love them). When your baby is sitting well enough to go in a high chair or buggy, they can be pushed gently in the baby swings. From about five months, MM loved chilling out in the baby swings, watching the other kids in the play park. Do you have any more suggestions for engaging a baby outdoors?